There is never a bad day fishing, especially when you are on the water with your kids. It’s hard to beat spending time together as a family in spectacular Colorado scenery practicing a sport they will enjoy for a lifetime. It is easy to get them outfitted with gear and equipment suited to their skill levels and ages. The experts at the Minturn Anglers fly shops in Denver, Minturn or Vail will gladly take the time to introduce all members of your family to kid-friendly gear. A bonus is that all youth under 16 can catch a full bag and possession limit without a Colorado fishing license. The Colorado Parks and Wildlife Commission goes further in encouraging the younger generation to enjoy our picturesque outdoors and develop their fishing skills by identifying locations in the state that are especially appropriate for child oriented outings. These sites are easy to access, and offer open areas on the shore or bank for casting, with good opportunities to catch a fish. There are also other attractions in the area, such as biking, camping, hiking, canoeing and picnic facilities. Keep in mind that some sites have a park access fee, and special fishing regulations may apply in some areas. 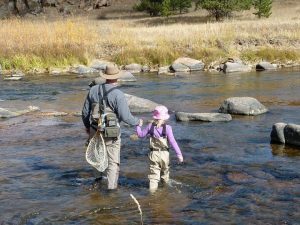 Whatever water you decide to explore, be assured that spending the time with your kids fly fishing Colorado waters will be an experience treasured and remembered for years!